Teaching Religion and Literature provides a practical engagement with the pedagogical possibilities of teaching religion courses using literature, teaching literature classes using religion, and teaching Religion and Literature as a discipline. Featuring chapters written by award winning teachers from a variety of institutional settings, the book gives anyone interested in providing interdisciplinary education a set of questions, resources, and tools that will deepen a classroom’s engagement with the field. Chapters are grounded in specific texts and religious questions but are oriented toward engaging general pedagogical issues that allow each chapter to improve any instructor’s engagement with interdisciplinary education. 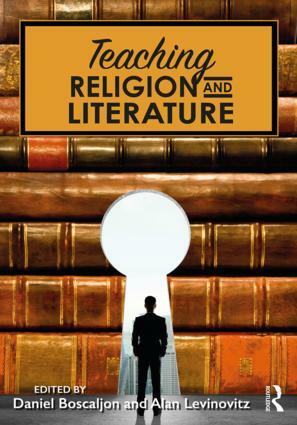 The book offers resources to instructors new to teaching Religion and Literature and　provides definitions of what the field means from senior scholars in the field. Featuring a wide range of religious traditions, genres, and approaches, the book also provides an innovative glimpse at emerging possibilities for the sub-discipline. Daniel Boscaljon is the author of Vigilant Faith, editor of Resisting the Place of Belonging and Hope and the Longing for Utopia, and author of several articles. He has taught several courses in theology, literature, philosophy, and interdisciplinary humanities as contingent faculty in the Midwest. Alan Levinovitz is associate professor of religious studies at James Madison University. He focuses on classical Chinese philosophy, religion and literature, and religion and medicine. He authored The Limits of Religious Tolerance and several journal articles. His journalism has appeared in Wired, The Atlantic, The Washington Post, Vox, Slate, and elsewhere.